Anyone who works outside in this cold can attest to this. 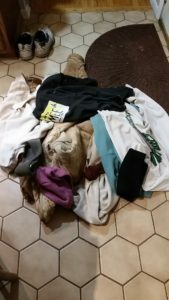 These are all the layers I wear ON TOP OF THE FIRST LAYER of clothes when I take care of the horses: 1 long sleeved shirt, 4 sweatshirts, winter carharts, neck cozy, hat, ear muffs, hoodie, gloves AND mittens. That on top of long johns, jeans, turtleneck and 2 pairs of winter socks. I’m telling you, I can’t even raise my hands above my head!!! Ugh! !